Substance: 200 mg Thiaminum, 50 mg Pyridoxinum, 1 mg Cyancobalaminum. (B1, B6, B12). 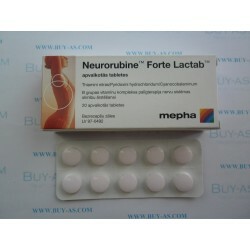 Neurorubine B Vitamin Complex. Neurorubine contains several B vitamins B1, B6, B12. B vitamins are required for normal metabolic processes in the body. B vitamins help with nerve pain and also nerve growth. B vitamins also required for blood cell proliferation and hence prevents anemias. There are no significant side effects from B vitamins as they are eliminated from the body instantly without any accumulation.